For all the locals and lovers of the iconic Darby Street, you'll be pleased to know there's a new kid on the block. 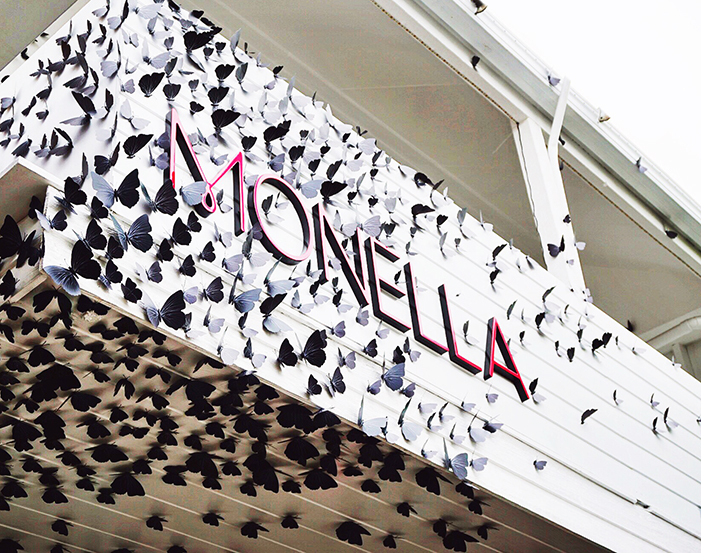 Joining the multitude of other delicious food places, Monella stands apart from the crowd. Not only in its wares, but with it's fresh style that is unlike any other in Newcastle. The unique shop front is sadly hidden behind a tree and an ugly traffic light. But look past it and you'll spot a beautiful white two storey building, covered with a kaleidoscope of black butterflies. Which officially makes it the coolest looking building in perhaps the entirety of Newcastle. The butterflies run from the outside of the store, and curl all the way inside to the front where you're greeted with a brightly lit store with pops of neon pink all around. 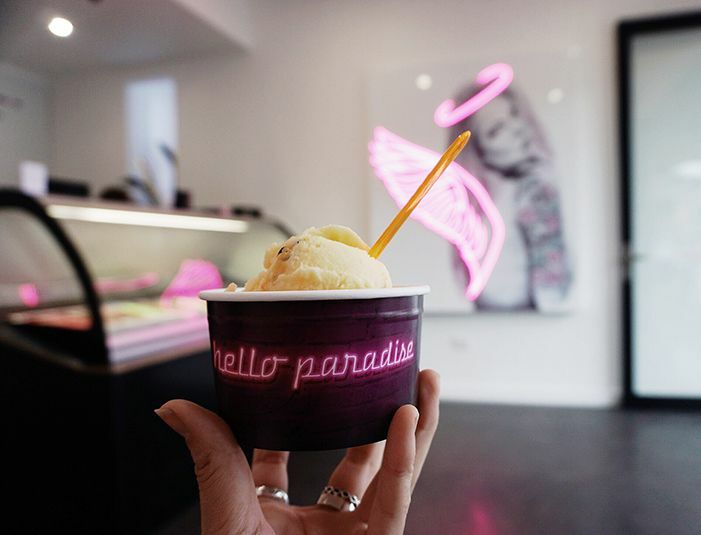 The stand out feature would have to be the large portrait on the wall of a neon tattooed angel, created by the talented Kia Eastburn of Kia Valli Designs. A style of mixed media I haven't come across before but would be glad to see more often. 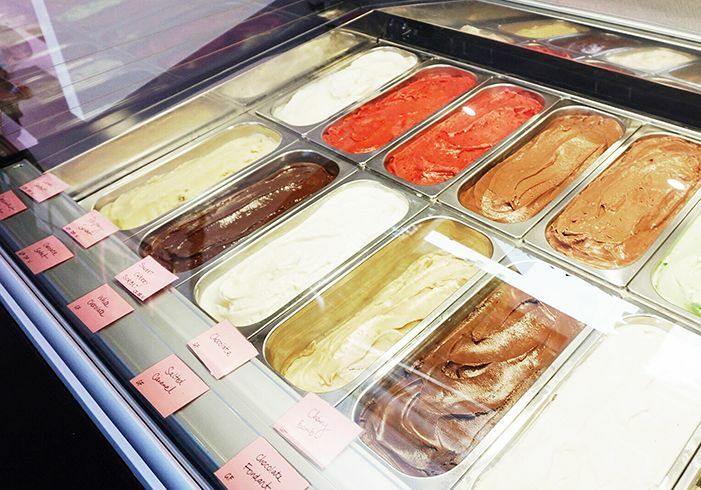 Monella boasts quite a large and different variety of flavours of gelato. With the majority being gluten free, as well as a good selection of vegan sorbets. There is sure to be a flavour for every individual. All of the goods are created on site, and new flavours added on the regular. 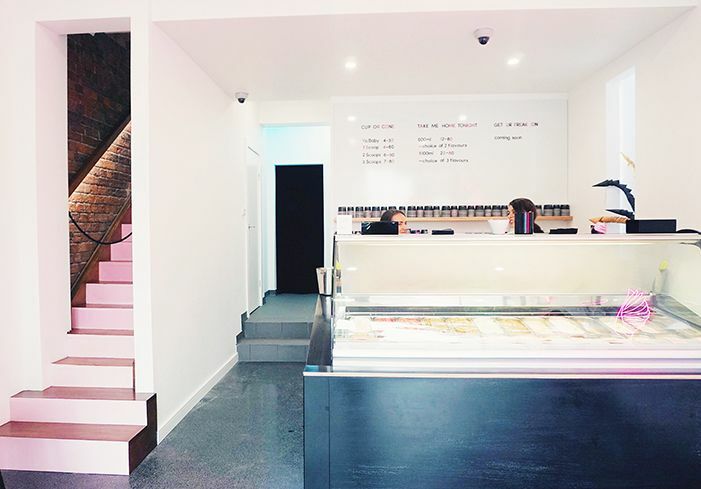 I'm keen to come back and try the Pavlova gelato they just displayed on the instagram. The staff behind the counter are lovely and chatty, letting you try any flavour you would like. After sampling a few, with each better than the last. I finally settled on regular ole peanut butter. Which was actually one of three different kinds of peanut butter gelato. My decision was not regretted, as I ate what seemed like a tub of frozen kraft spread. But better, because it was in dessert form. I took along my favourite vegan Chezarne and she went with the Passionfruit Sorbet. Which I also tried, and it was fruity, sweet and bursting with flavour. I can absolutely not wait to return again, especially with the promise that the pretty pink ombre stairs on the left will soon be open to the public. Leading to a whole range of rooftop seating, and I'm sure a plethora of pink neon. It will also just be another excuse for me to try more flavours of gelato. Open from noon until late, Monella is the perfect place to satisfy your late night sweet cravings. As well as picking up a frozen treat on your walk to the beach. Ok that's on my January list! Mmmm....Gelato...I'd llove to try Passionfruit Sorbet, it sounds mouth-watering and now I am craving so goood gelato Yum! Oh yummy sounds good will put in on our list when we are next in Newy thanks Tegan.